Most WDW regulars can agree on this sentiment. Staying on Disney property makes all the difference in your vacation quality. However; all magic comes at a price, and Disney World is no exception. Even the resorts in the most affordable (officially dubbed “value”) tier, are usually priced at a higher cost than off-property equivalents. Despite that, I still give my full endorsement for on-property accommodations. In order to assist thriftier tourists, here’s a summary for each of the on-property value resorts. . Take a gander and see which choice may best fit your needs, preferences, and Disney style! Throughout the early 90s, Disney opened its first set of value tier resorts. These include the colorful All-Star Movies, All Star Sports, and All Star Music Resorts. Extremely popular with families and regular visitors, here are just some things to note. Theme: While each hotel shares a similar layout, the themes vary. All Star Movies celebrates classic Disney films by transporting guests right into their favorite stories. (For example, if you’ve ever wondered what it would be like to shrink down to the size of a toy in Andy’s Room, you’ll definitely want to book a room in the Toy Story section!) Over at All Star Sports, this resort features the most watched and beloved worldwide sports. Walk through a larger-than-life foosball table and take pictures with sporting equipment that is larger than your family van. Lastly, All Star Music is the perfect hotel choice for the musician in your life. Along with the “instrumental” decorations, each section of the resort is inspired by a unique music genre. (If you’re like me, you’ll want to book a room in the Broadway section so you can enjoy the constant music loop of show tunes!) No matter which hotel you select, the theming will not be lost on you. Room Types: 99% of the rooms are of the typical four-person capacity nature. However; if you find yourself travelling with a larger party, there are available family suites in the All Star Music Resort! Otherwise, the rooms are ordinary (but comfortable) and include two queen beds, a small table and chairs, cable television, and a divided bathroom. While the in-room theming is more subtle than the resorts themselves, they still feature dashes of Disney in the carpeting, wall paper, and bedding. True, the interior design won’t blow you away, but the room will fulfill all sleeping/showering needs. Dining: All three hotels have food courts that are full of comfort foods. From fluffy mickey waffles to juicy burgers, there are options for even the pickiest eater. In addition to that, guests at any of these resorts can have pizza delivered to their room! And guests who are 21 and over can enjoy a tasty beverage at one of the poolside bars. After all, what could be more luxurious or indulgent than convenient cheesy pizza and a refreshing Mai Tai? So many excellent meal choices are mere steps from your hotel room. Pool Areas: Naturally, each venue features quirky and charming areas to take a dip. Dive under the shooting water fountains in the Fantasia pool at All Star Movies or relax at the guitar-shaped Calypso pool at All Star Music. These pools all vary in size and depth. Whether you want to fall asleep in a lounge chair or practice your cannon balls, there will be an option for your poolside mood. Overall Pros and Cons: Admittedly, these resorts attract larger parties, so the All Stars can’t claim the most serene atmosphere. Additionally, guests who are looking for a higher-level of quality and detail in the rooms, may be disappointed with the simple furnishings. Despite that, the All Stars continue to offer the lowest price for on-property guests. So, if you’re a WDW visitor that is just looking for a place to hang your hat on your way in and out of the parks, then these accommodations are right up your alley. As a result of the popularity of “value tier” lodgings, WDW opened the Pop Century Resort in 2003. 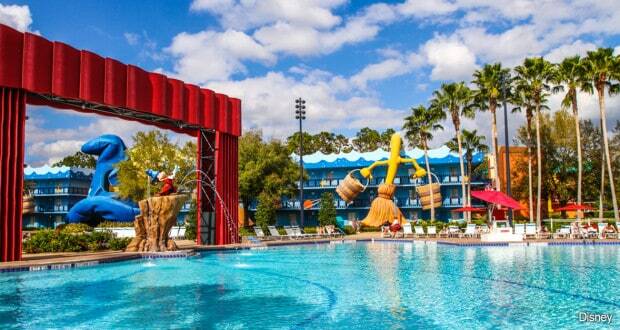 While also maintaining affordable prices, Disney designed this resort to be of next-level quality for their guests! Theme: Taking some inspiration from the All-Stars, Pop Century is decked out in flashy, bright, and mammoth icons. True to its name, the theme of this resort celebrates American pop culture. Specifically, it features icons, themes, and technologies that were popular from the 50s through the 90s. (Each section of the resort is dedicated to one of these time periods.) The eclectic mix of decades can make for some strange visuals, but it also provides some great photo ops! After all, who wouldn’t want to get a family photo in front of a giant Mickey Mouse phone or Walkman? The ambience may be a bit haphazard, but it’s pure fun. Dining: When guests have a rumbly in their tumbly, they head straight to the Everything Pop food court! Here, guests can order food from a variety of stations (that tend to vary more in choices compared to their All Star competitors). Most importantly though, this is where you can order the infamous Tie-Dye cheesecake. Enjoy a slice of this silky, heavenly dessert and (if you’re of age) go have a drink at the Petals poolside bar. You may never want to leave. Pool Areas: Speaking of pools, Pop Century features three including the Bowling Pin pool, Computer pool, and Hippie flower-shaped pool. (And with such a huge resort to traverse, you’ll be happy to know that these pools are all spread out for your convenience!) With so many options, you’ll definitely want to set aside one day in your trip to just catch some rays. Overall Pros and Cons: Again, the design of Pop Century learned well from some shortcomings of the previous value hotels. The food court is more varied. The layout is more spacious. Most attractive of all, Pop Century does not have to share buses with any other on-site resorts. (This is something that is lacking at the All Stars. All three resorts share a singular bus system.) Yet, while Pop Century is a market improvement for value accommodations, the sheer size of the resort and the mismatched themes can be off-putting to some visitors. Despite that, Pop Century has a place of honor in the hearts of many guests and continues to hold a title of “fan-favorite”. Unbeknownst to some, the newest value tier resort (Art of Animation) was actually supposed to be an addition of Pop Century. However; when the recession hit in the states, these plans were scrapped. When the idea was revisited, WDW decided to go in a slightly different direction and built an entirely different hotel. While this new resort mirrors its value tier siblings in many ways, The Art of Animation is arguably a game-changer for its entire category. Theme: The Art of Animation Resort features (what else?) the artistry of animated films! The hotel’s lobby itself is decked out in concept sketches from several, beloved features. Beyond the lobby, the resort is divided into four sections that honor the following Disney films: Finding Nemo, The Lion King, Cars, and The Little Mermaid. Take pictures with gigantic statues of characters, stroll through the neon-lit Radiator Springs, and walk among foliage that is pruned to look like floating seaweed. No matter where you end up booking a room, you’ll want to explore the entire resort with a camera. Room Types: Speaking of rooms, the highly detailed theming doesn’t stop outside your bedroom door. Each room matches its movie to a thematic T from the bedding to the shower curtains to the very shape of the light fixtures. On an even more exciting note, 75% of the rooms are family suites! These rooms contain two separate sleeping areas, three beds, and two full bathrooms. (This is an absolute gem for families with multiple females!) Finally. The entire family can fit in one hotel room without stumbling on top of one another! Dining: Guests at the Art of Animation can grab tropical beverages at the Drop-Off poolside bar and select from a huge list of entrees in the Landscape of Flavors food court. Arguably the best value-tier food court, you can order almost anything from Caprese sandwiches to hand-scooped gelato. You’ll only face one hurdle. Making your meal selection. Pool Areas: Each area (with the exception of The Lion King) features its own pool. The most popular spot is Finding Nemo’s Big Blue Pool that has incredible underwater music and a special splash area for little ones. And while this is all well and good, I’d urge you not to pass up the tranquil Cozy Cone oasis. This is a wonderful spot for both thematic immersion and a nap! Overall Pros and Cons: Honestly, I have little criticism to offer for this resort. It surpasses its competitors in terms of room quality, theming, dining, and magical immersion. Despite that, the family suites can get pretty pricey (depending on the season) and it may be harder to snag this reservation if you’re looking for a standard-sized guest room. However; if you can grab a room at this venue, be prepared to become a repeat visitor. With so many spectacular hotels to pick from, it’s no wonder that so many guests are devoted to the value-tier! No matter what you select in the end, you and your family will come out on top.